Infuse your skin with essential moisture. 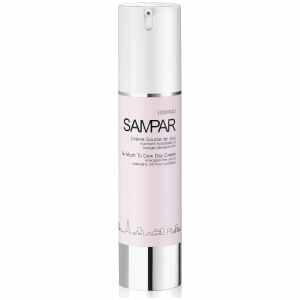 The So Much To Dew Day Cream from SAMPAR is an innovative moisturiser that delivers 24 hours of non-stop moisture** to help protect against dehydration. Enriched with a host of active ingredients, the next generation formula instantly quenches skin; its dose of Hyaluronic Acid attracts and retains moisture, whilst Essential Fatty Acids strengthen skin's barrier to lock in hydration for hours. Delivering essential water to skin, it utilises a Smart Hydrating Complex that maintains vital water within cells, and an Urban Advance Complex to provide antioxidant protection. Skin’s comfort, tone and radiance is restored, and the complexion is plumped with moisture. Housed in airtight packaging to protect the integrity of active ingredients. **Corneometric test performed with 11 volunteers. Apply morning and/or night to cleansed skin with a light massage. Aqua (Water), Glycerin, Imperata Cylindrica Root Extract, Sodium Polyacrylate, Dimethicone, Phenoxyethanol, Erythritol, Dimethicone/Vinyl Dimethicone Crosspolymer, Cetyl Alcohol, Chlorphenesin, Trilinolein, Butyrospermum Parkii (Shea Butter), Hydrogenated Coconut Oil, Isopropyl Palmitate, Paraffinum Liquidum, Peg-2 Stearate, Stearyl Alcohol, Olus Oil, Titanium Dioxide, Xanthan Gum, Sodium Citrate, Ceteareth-25, Polyquaternium-39, Sodium Stearoyl Lactylate, Butylene Glycol, Tocopheryl Acetate, Sodium Lactate, Parfum (Fragrance), Triolein, Palmitin, Sodium Stearate, Aesculus Hippocastanum (Horse Chestnut) Extract, Lactilol, Xylitol, Triethanolenin, Caprylyl Glycol, Carbomer (Soybean) Sterols, Sodium Benzoate, Potassium Sorbate, Mentha Piperita (Peppermint) Extract, Sodium Hyaluronate, Homarine, HCL, Carnosine, Lactic Acid, Butyrospermum Parkii (Shea) Butter Seedcake Extract, Triarachidin, Hydroxypropyl Bispalmitamide Mea, Acrylates/C10-30 Alkyl Acrylate Crosspolymer, Magnesium Nitrate, Ethylhexylglycerin, BHT.